I randomly downloaded this book from one of the ads on my Kindle. I love those ads because sometimes they are spot on. I figured, heck, why not give this book a read? The cover art was good and it intrigued me. Turned out, One Pink Line by Dina Silver was actually a good book and hit relatively close to home. The book is about Sydney and her daughter Grace. It's a bit more about Sydney, but it toggles between their perspectives. When Sydney finds herself pregnant after college, she is faced with a ton of uncertainty. That pink line of the pregnancy test changes everything. When Sydney decides to keep the baby with the full knowledge that she will receive no help from the father, she is determined and brave. From there the stories of Grace and Sydney unfold. What I loved about this book was the simplicity of it. 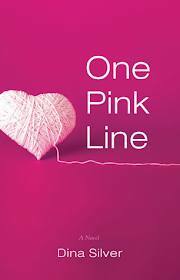 So many books these days involve complicated plots, complicated characters, and twists and turns and yada yada--but not One Pink Line. This is a book that is not only simple, but beautiful in its simplicity. It's a story of what makes a father, but also a story of love. For me, this book hit home in some unexpected ways. I was raised by a man who is not my biological father, and so I have often times grappled with society's version of "what is a father?" However, I never let that define for me what I thought of my dad. One Pink Line reminded me that there are lots of women and girls who go through all the same things I went through. It's a never ending journey, really, but at the end of the day, I am also reminded that women like me, who were raised by a non-bio dad they loved, get a glimpse of something truly special about humanity. Love is transcendent in this way...it doesn't matter if you are tied by love or by blood because both bonds are equally strong. This book is the story of realizing that fact of life and love, while simultaneously showing the journey of what so many mothers go through--an experience I have not had. Well written, and simple, this book drew me in and held my attention. I fell in love with the characters and enjoyed the heartstrings this book sounded.